Today I am guest posting at Everyday Maven! Over the past year, I’ve had the pleasure of getting to know Alyssa through her blog, Everyday Maven, where she creates terrific recipes that promise good taste and health. I was delighted when she graciously asked me to share a healthy dessert on Everyday Maven. 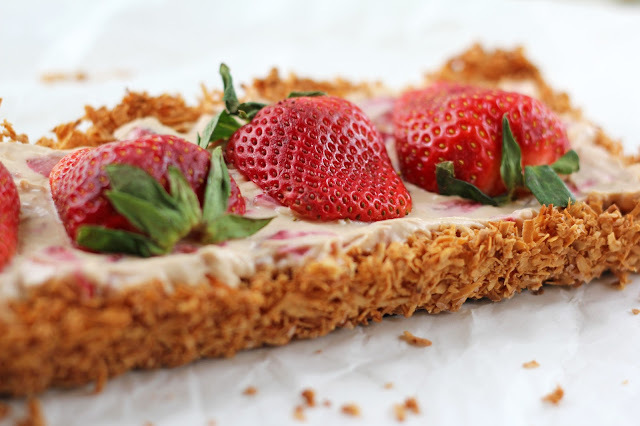 This Creamy Strawberry Macaroon Tart is a festive and indulgent way to welcome spring. Head on over to Everyday Maven for the recipe. While there, take some time to explore Alyssa’s inspiring blog, where I’m sure you’ll discover something tempting and delicious! Click here for the full post and recipe on Everyday Maven. A boisterous weekend is promised with the arrival of Purim! Purim is a time of merriment, the holiday celebrating Queen Esther and Mordecai’s victory of saving the Jews of Persia from the wicked Haman. Children and adults alike dress in costumes and festivities abound. While hamentaschen are a popular cookie to bake for Purim (when I was cooking at Hillel UW I was baking hundreds of hamentaschen at this time each year! 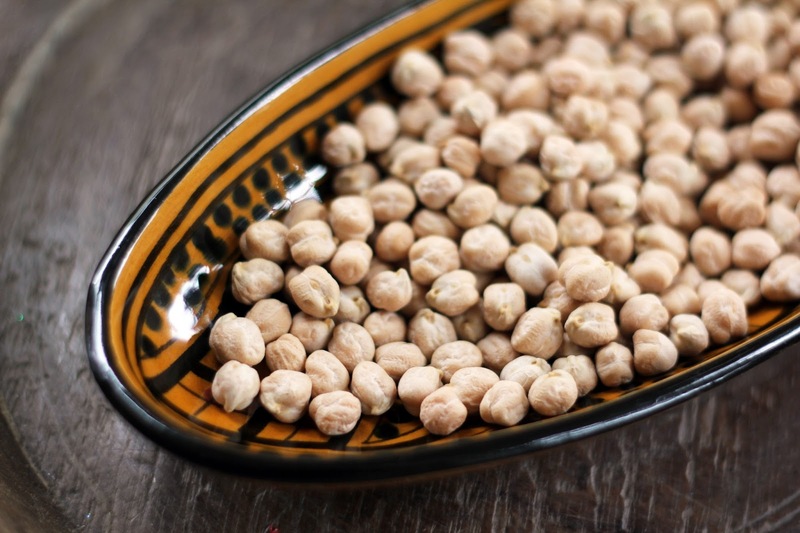 ), chickpeas are also traditional to eat. According to the Purim story, while Queen Esther lived in the court of King Ahasuerus, she ate mostly legumes so that she could maintain a kosher diet. For this reason, it is customary to eat chickpeas on Purim. 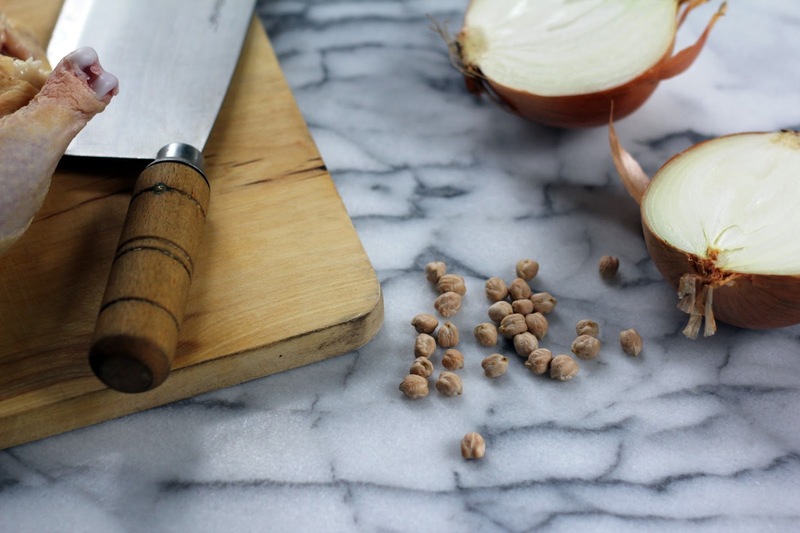 As a simple snack, chickpeas are often warmed and sprinkled with salt and lots of freshly ground black pepper. 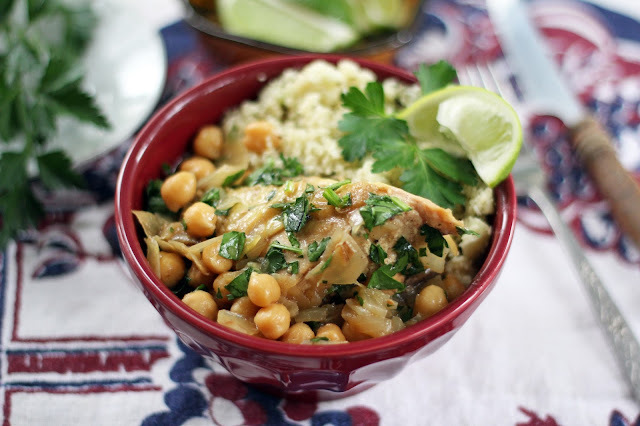 Over the past fifteen years or so, I’ve been making a chickpea and chicken stew that has become a favorite in our family. In the spirit of Purim, I include a blend of Persian-inspired spices with cinnamon, saffron and cardamom. I begin by soaking dried chickpeas the night before I want to make the stew. Once this step is done, though, the stew is quick to prepare. The chickpeas cook along with the chicken, making it a one-pot meal (and even a possible weeknight dinner). After dicing a couple of onions and sautéing them in olive oil, I stir in the spices and chicken, followed by the soaked chickpeas, some chicken broth and a squeeze of lime. At this point, you can leave the stew to simmer while you chop a salad, steam some rice (or my new favorite, cauliflower “rice”) and open a bottle of wine. The fragrant spices mingle together as the stew bubbles, taking you to far-away lands and filling your house with a delicious aroma. 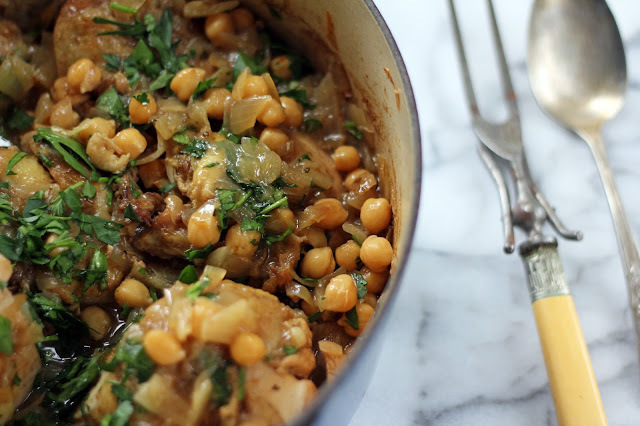 The chicken is tender and velvety, the chickpeas add a soft pop of texture and the onions melt into a luscious sauce. A bowl of stew energizes us for the Purim carnivals and hamentaschen eating yet to come. Chag Purim Sameach (Happy Purim)! The night before you plan to make this stew, cover the chickpeas in a bowl with water and let soak overnight. In a large Dutch oven or heavy soup pot (I use a 5 quart size), heat the olive oil over medium-high heat. Add the onions and cook until soft, about 7-8 minutes, stirring a few times. Add the cinnamon, ginger, cardamom, saffron, salt and pepper and after a stir let cook for a minute. Add the chicken pieces and allow the chicken to cook and brown for a few minutes. Drain the chickpeas and stir them in. Pour in the chicken broth and lime juice and gently stir to mix. The chickpeas should be covered but the chicken may not be completely submerged – this is ok.
Bring the stew to a boil, partially cover the pot and lower the heat. 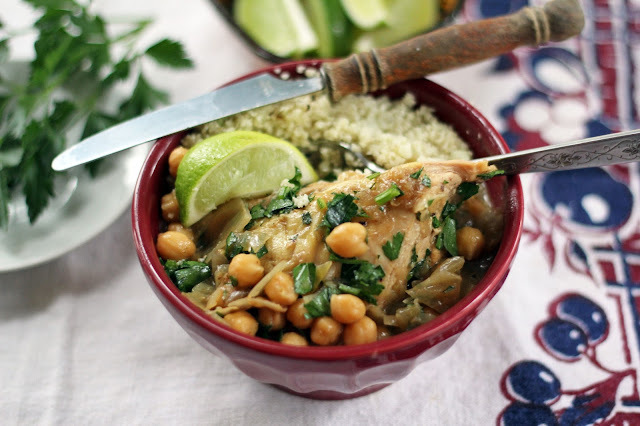 Let simmer for about 45-50 minutes, until the chickpeas are soft and the chicken is tender. The stew can be prepared ahead and rewarmed before serving. Just before eating, stir in the chopped parsley and taste for additional salt and pepper. Serve with bowls of steamed rice. 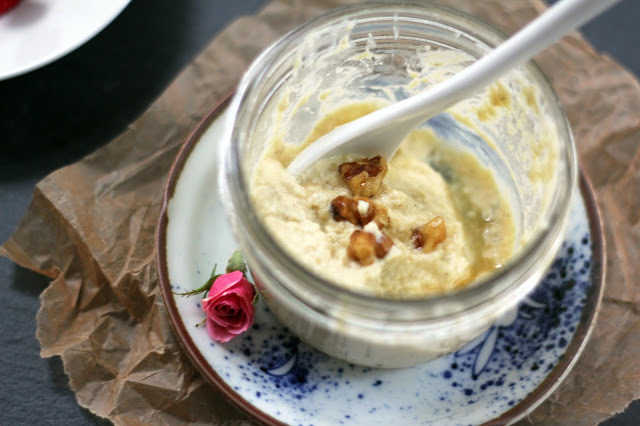 Abby Dodge never ceases to inspire when it comes to baking, and this month’s luscious Vanilla Pots de Crème for the #BakeTogether challenge do not disappoint. 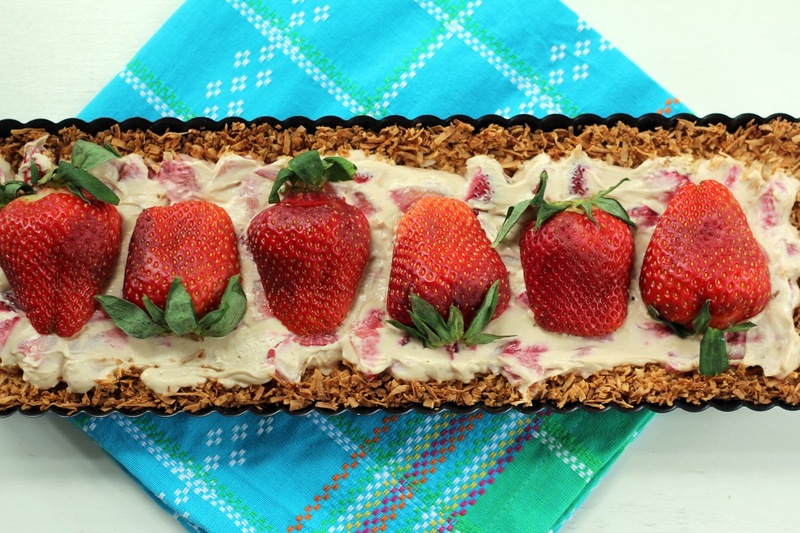 She shares her recipe and invites us to create our own version. Happy to do so! Vanilla stars in these little custards. I’ve sung vanilla’s praises many times, and am always delighted to let it shine (and may even take Abby’s suggestion to dab a little behind my ears before a night out). Sweetening these little pots with maple syrup was my next choice, and I poured a little extra in the bottom of each jar as a sweet surprise. I also toasted some walnuts with maple syrup and flaky sea salt to sprinkle on top of the custards. 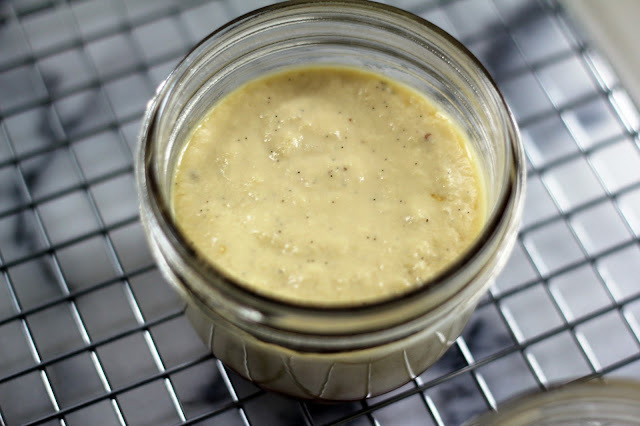 After steeping vanilla beans and bay leaves in some half and half for two hours, the custard is lightly cooked on the stove top with egg yolks and maple syrup and then baked in the oven in a water bath. As always, Abby provides detailed instructions and wisdom with her recipe. 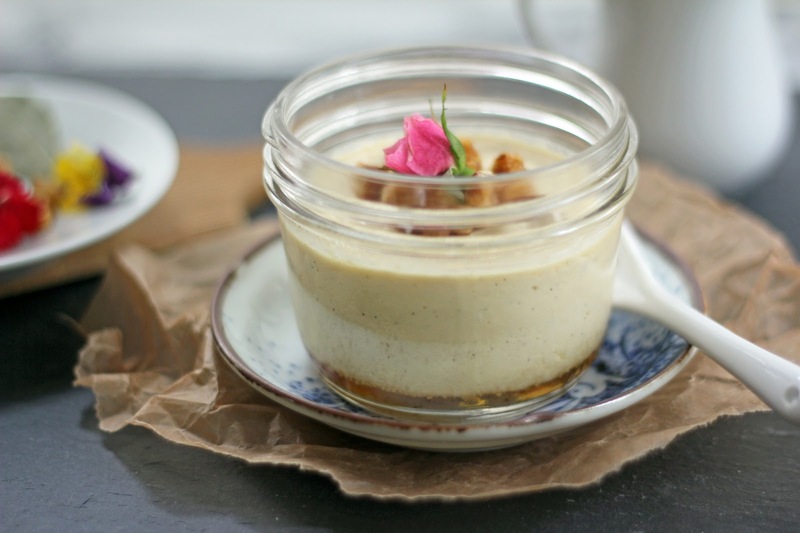 Delicate and silky, with flecks of vanilla bean, this seductive dessert is sublime. 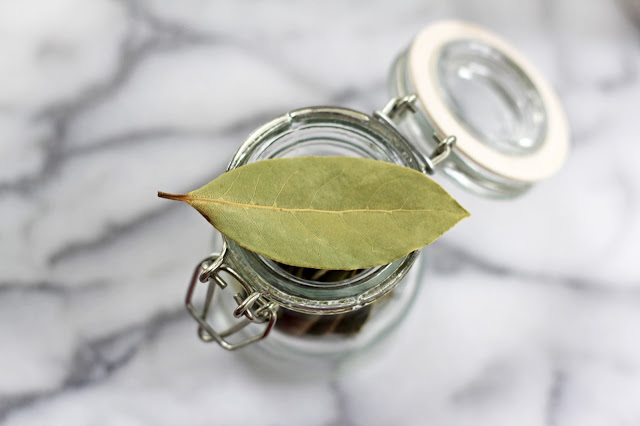 The bay leaves don’t impart a particularly distinct flavor, but rather round out the vanilla and add a savory backdrop. A subtle sweetness comes from maple syrup and the walnuts add a nice bit of salty crunch. The baked custards need to chill for at least four hours, so they are marvelous to prepare a day ahead, making dessert easy to pull out of the fridge and serve. Pour the half and half into a medium sized sauce pan. With a sharp knife, split the vanilla bean open lengthwise. Using the tip of the knife, gently scrape the beans from inside and add them and the vanilla pod to the half and half. Drop the bay leaves in and bring the mixture to a simmer over medium-high heat. Don’t let it boil, heat until it is hot and beginning to steam. Remove from the heat and cover. Let the mixture steep for at least 30 minutes and up to 2 hours (I steeped for 2 hours for maximum flavor). Preheat the oven to 325 degrees. Arrange four 6-ounce ramekins or jars in a baking pan with 2-inch high sides. I used an 8-inch square baking pan. Pour 1 tablespoon of maple syrup into the bottom of each ramekin. On a small baking pan, toss the walnuts with the remaining 1 teaspoon of maple syrup and flaky sea salt. Pop in the oven to toast until golden, about 6-7 minutes, stirring once. Remove and set aside to cool. In a glass 2-cup measuring cup, whisk the yolks, 1/4 cup maple syrup and kosher salt until well blended. (Don’t let them sit or the eggs will begin to break down.) Uncover the half and half and, while whisking, slowly pour the egg mixture in (with the vanilla bean and bay leaves). Whisk until well blended. 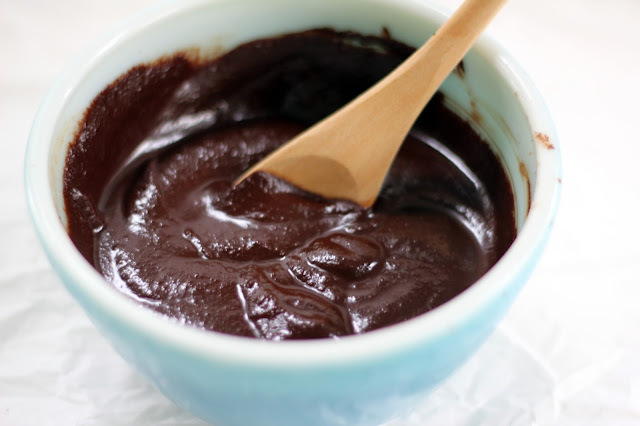 Cook over medium-low heat, stirring constantly with a spoon or heat-proof spatula, until the custard thickens and coats the back of a spoon (170-172°F on an instant read or candy thermometer), about 4 to 5 minutes. 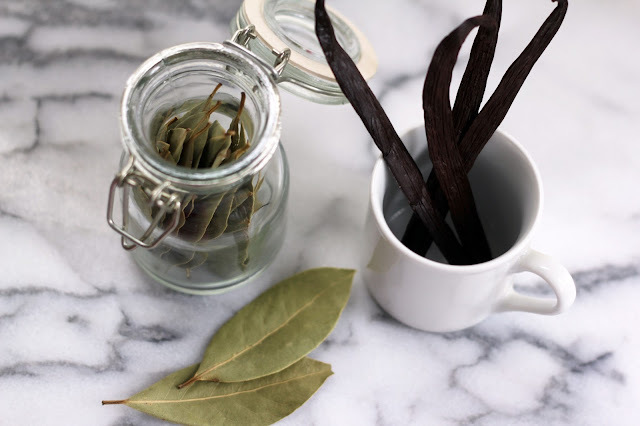 Slide the pan from the heat and remove the vanilla bean and bay leaves. Scrape any custard from the pod and leaves back into the custard. Pour the custard into the ramekins on top of the maple syrup (it’s easiest to pour the custard back into the 2-cup measure and then pour it from there into the ramekins). Carefully fill the baking pan with hot tap water to come halfway up the sides of the ramekins and cover the pan loosely with foil. Bake until the pots de crème wiggle like jello when nudged, 35 to 45 minutes depending on thickness of the ramekin walls. Transfer the baking pan to a rack let cool completely. Cover with plastic wrap and refrigerate at least 4 hours or up to 2 days before serving. 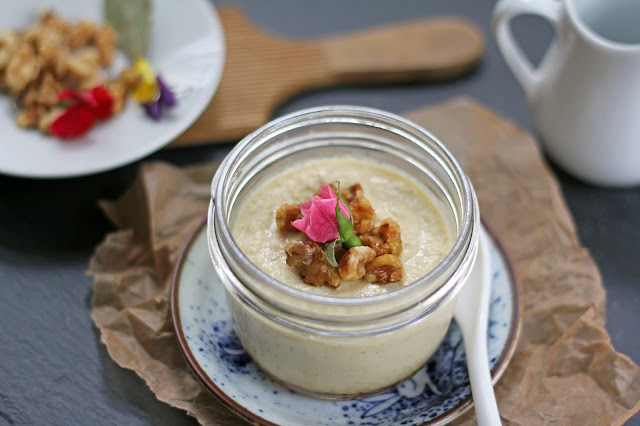 When ready to serve, top each pot de crème with a few toasted walnuts. 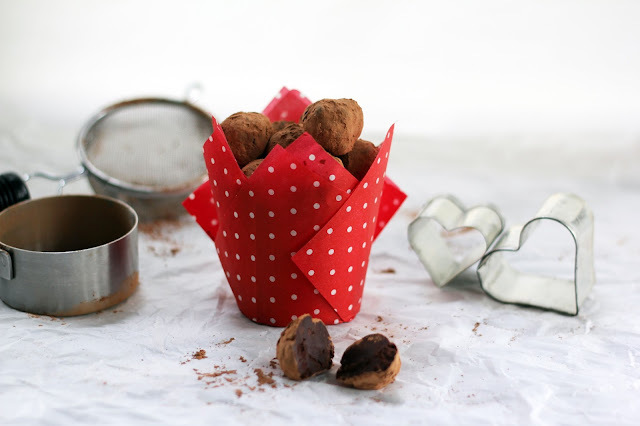 With Valentine’s Day approaching, I’m excited to share some chocolate truffles with you. While eating chocolate is an almost daily experience in our house, this chocolate-inspired holiday calls for some extra indulgence and these rich, dark, silky truffles provide just that. 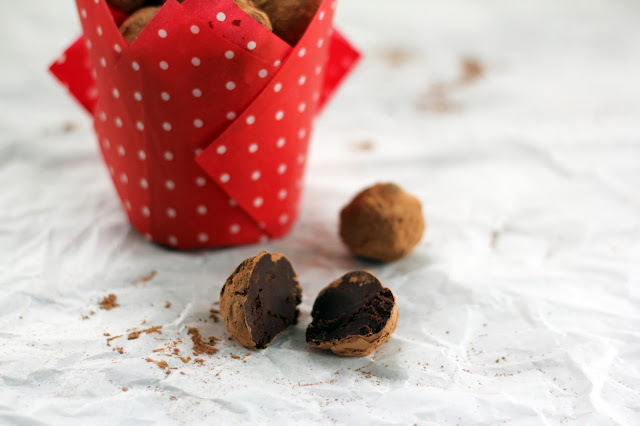 Truffles elevate any occasion and add an elegant touch of sweetness. Happily, they are quite easy to make, with only a few ingredients and a dusting of cocoa powder. I usually prefer pure dark chocolate truffles with a whiff of vanilla, and you can easily tailor them to your taste just by adding a touch of bourbon, rum or your favorite liqueur. Lately, though, I’ve discovered the joys of bitters. 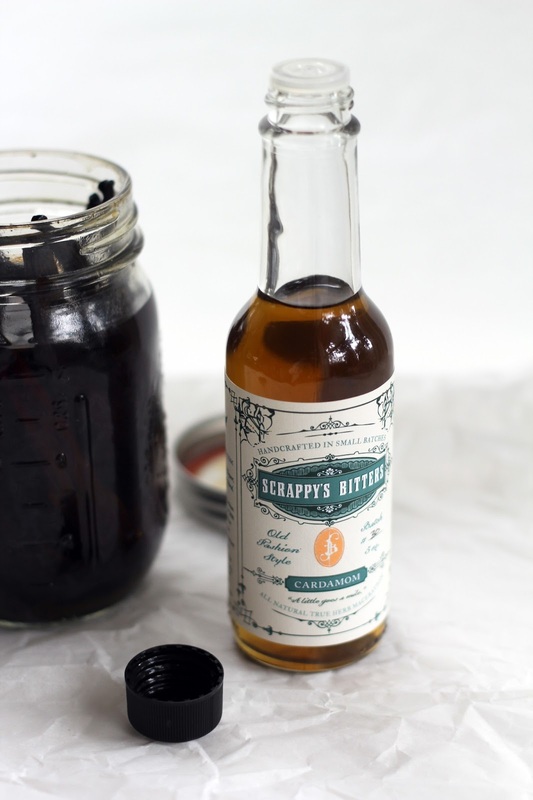 Scrappy’s Bitters, crafted here in Seattle, have a tempting selection of flavors. They enhance glasses of seltzer and make wonderful cocktails (we recently made this delightful one with grapefruit bitters). My newest favorite is their cardamom. I’ve been adding a dash or two to my coffee, and just made a marvelous hot toddy with ginger tea, honey, bourbon and a few drops of cardamom bitters. So as I was making these truffles, I reached for that bottle of bitters sitting on the counter. I didn’t want the cardamom to overwhelm, and with bitters a little bit goes a long way. A couple of dashes scented the truffles with a warm spice and blended beautifully with the homemade bourbon vanilla that was already mixed into the glossy bowl of melted chocolate and cream. After chilling in the fridge, I rolled small scoops in raw cacao powder to finish them. Not too sweet and extremely rich, with hints of cardamom and vanilla, these truffles are divine and handmade with love. They have a rustic, charming appeal and are a luscious sweet to savor while snuggling with your Valentine. 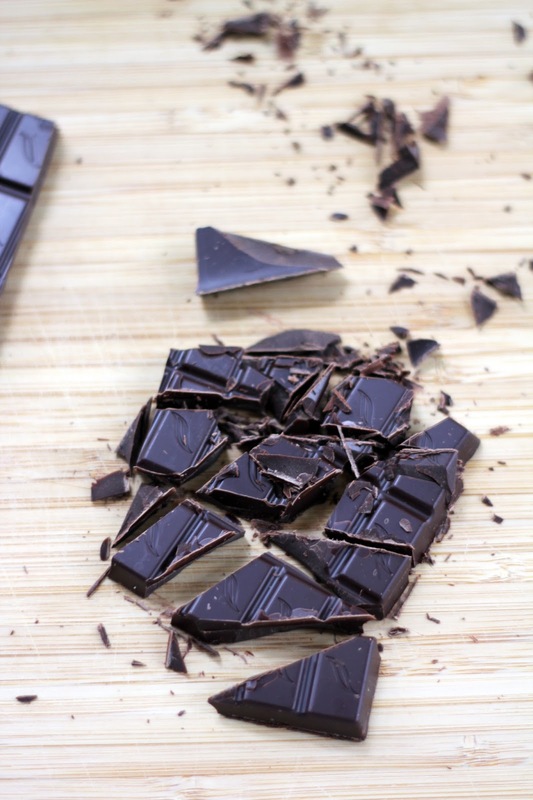 Chop the chocolate and set aside in a small bowl. Bring the cream to a boil in a small saucepan. Watch it closely to make sure it doesn’t boil over or scorch. Pour the hot cream over the chocolate and gently stir to melt the chocolate. Keep stirring until it is smooth and glossy. Add vanilla extract and bitters and mix in. Cover the bowl and pop in the fridge to chill until firm, about 2 hours (can make ahead and chilled overnight). Sift the cocoa powder onto a sheet of parchment paper. Remove the truffle mix from the fridge. 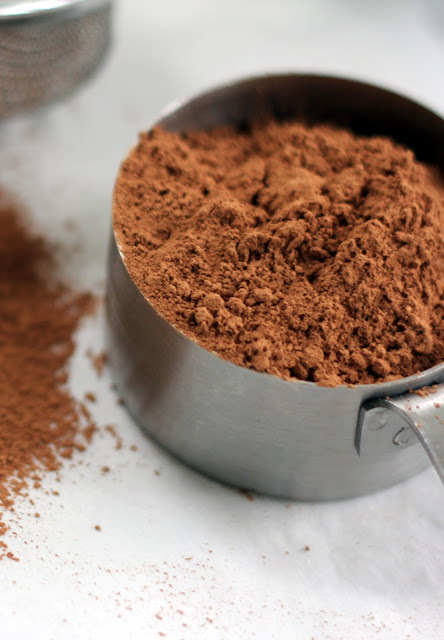 Using a teaspoon or very small cookie scoop, drop rounded scoops of the truffles onto the cocoa powder. 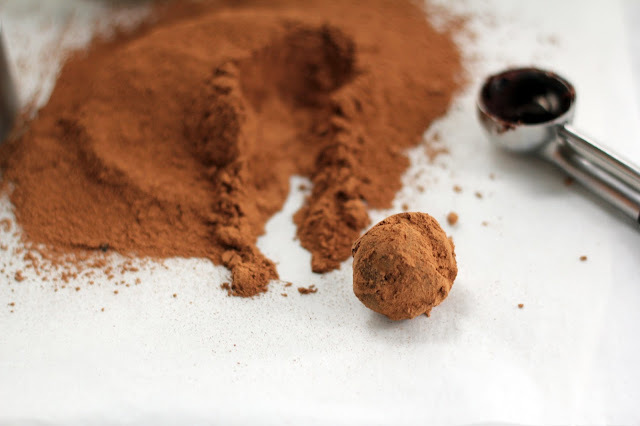 Roll each truffle until it is well coated in the cocoa powder. 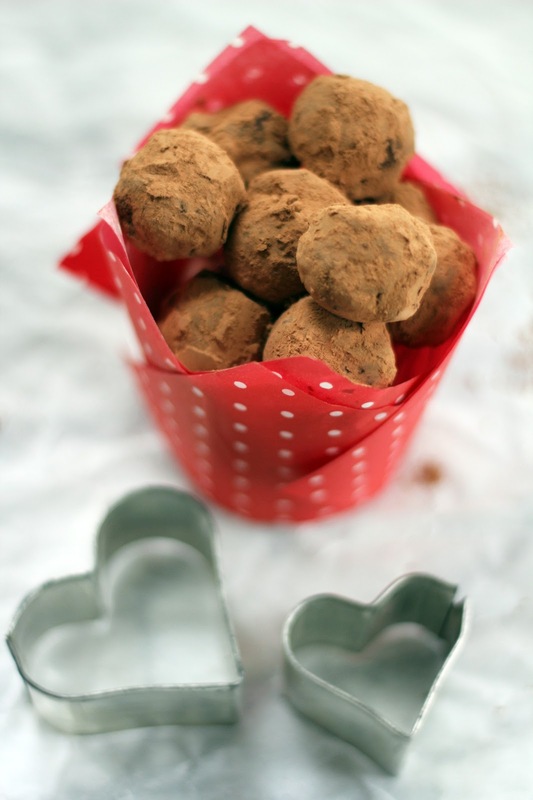 Store the truffles in a covered container in the fridge where they will keep for 2 weeks. I have to share with you what I’ve been eating lately for breakfast. Most days, I wake up eager to get into the kitchen (of course, pouring a big cup of coffee may be part of this, too) where I usually have a list of what I’d like to cook, what I need to prep for dinner or a new recipe idea to play with ... but breakfast takes priority before I dive in. With early morning light softly coming through the window (yes, our pitch-black mornings are beginning to brighten! ), I sip my coffee and think about what to cook up. I like to start the day with protein and prefer savory breakfasts with eggs. As much as I adore pancakes, if I make a batch I always have to have an egg alongside. Now that our backyard hens are laying again after the dark winter days, I am happily collecting eggs and admiring their bright, sunny yolks. This past December, I had Naomi Duguid’s beautiful book, Burma, on loan from the library and did quite a bit of cooking from it. I’ve since added it to my wish-list since it is a marvelous collection of stories, history and very delicious dishes (a new favorite is Golden Egg Curry). 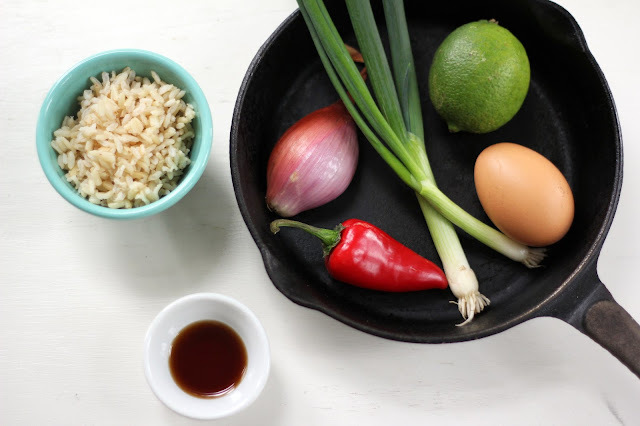 In addition to chopping and frying lots and lots of shallots, I fell in love with the combination of fish sauce and lime juice that is the foundation for many of the meals. A bowl of leftover brown rice inspired me recently to think about a change from my usual eggs-on-toast-with-avocado. 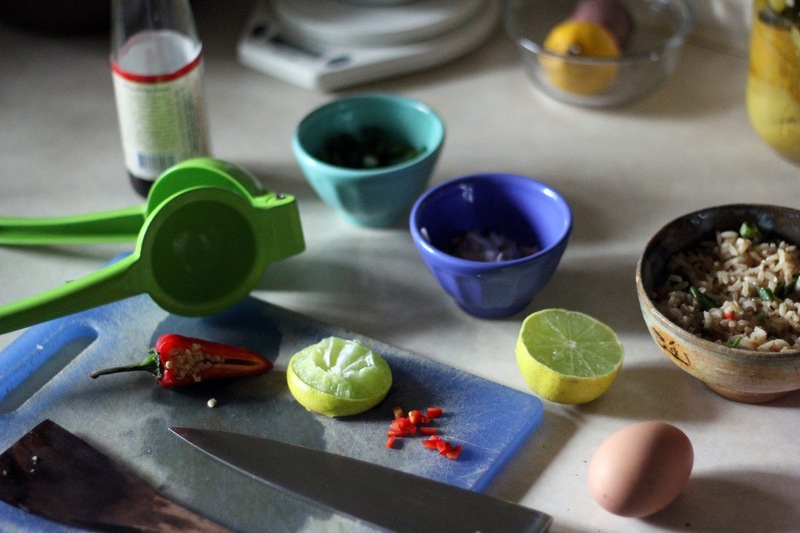 With fish sauce and lime juice still on my mind, it wasn’t long before I was chopping green onions, chiles, and, of course, shallots to whip up a fine breakfast. I find that if I keep little bowls of diced onion, ginger, garlic or some leftover veggies in the fridge, then this is indeed quick to prepare. But keep it simple, it’s first thing in the morning after all. 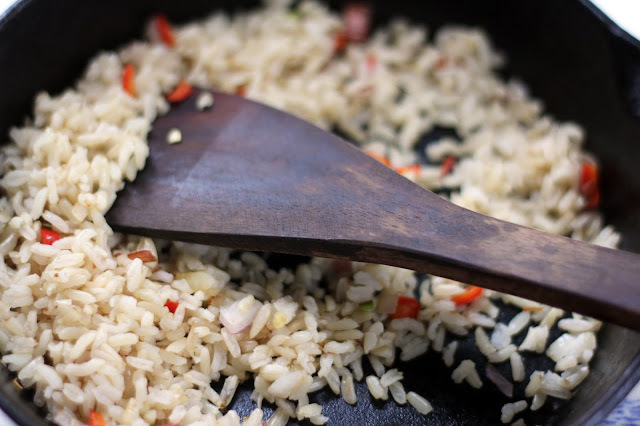 The rice is warmed in a bit of coconut oil with shallots and chiles, then doused in fish sauce and lime juice. 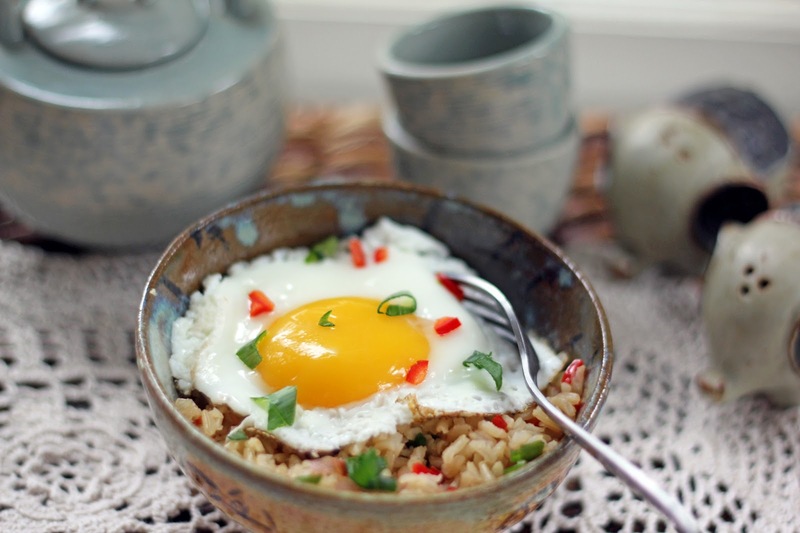 A fried egg, sunny-side up, tops it off with a sprinkling of green onions. 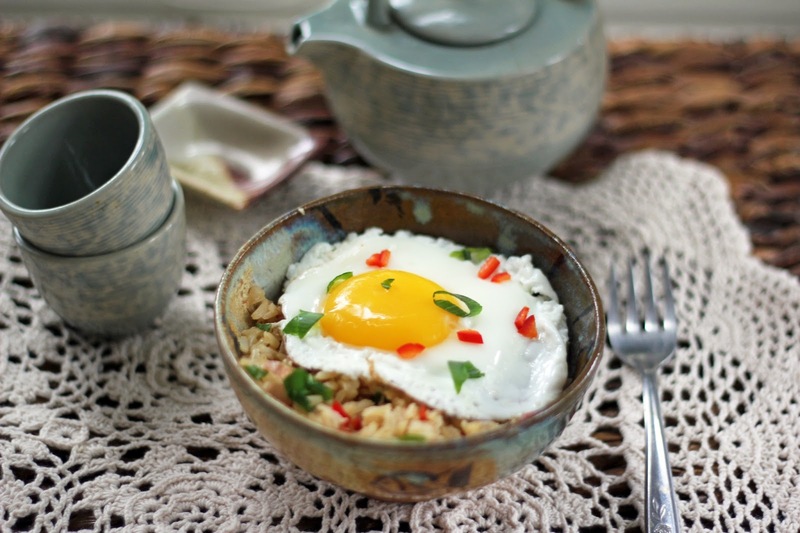 The salty, sour flavors awaken your taste buds while the creamy egg yolk coats the rice lusciously. A satisfying, energizing breakfast, and best of all, only one skillet! Warm the coconut oil in a small skillet over medium heat. Add the shallots and red chile and sauté for a few minutes, until soft. Add the rice and stir to warm the rice and mix in the shallots and chile. Add the fish sauce and squeeze the lime over the rice and stir. Taste to see if you like the salty-sour balance and add more of either. 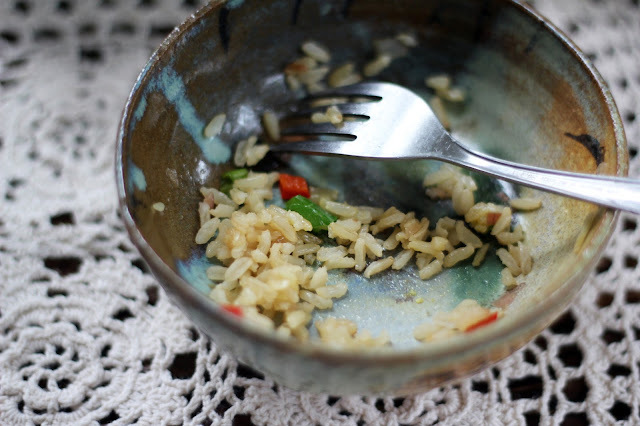 Scoop the rice into a small bowl. If needed, add a bit more of coconut oil to the skillet and warm. Crack the egg in and fry sunny-side up or however you prefer. Slip the egg out of the skillet onto the rice, scatter with some green onions and salt and pepper to taste. Pour another cup of coffee and enjoy! Citrus season abounds. I can’t seem to buy fruit quickly enough around here! We are eating oranges and satsumas and tangerines every day – I even ate a Meyer lemon when a craving for citrus hit and the fruit bowl was empty. Citrus’ bright flavor is a burst of sunshine during these winter months and just what we need to tide us over until the first whispers of spring arrive. 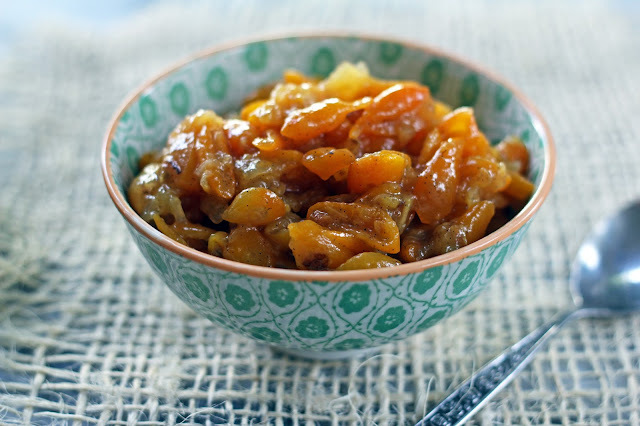 With lemons, limes and oranges spilling over at the markets, I decided to revisit marmalade. I have not been a real fan of marmalade in the past ... eating peels never really grabbed me. 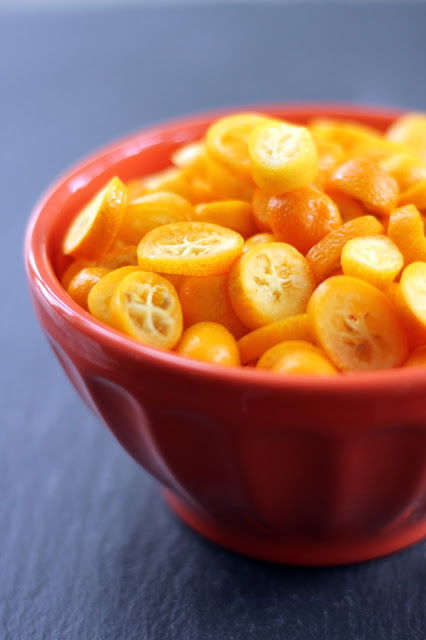 But I do like kumquats and happily eat them sliced, peel and all, in salads. Having never cooked with them before, I began to wonder if they would open me up to marmalade? 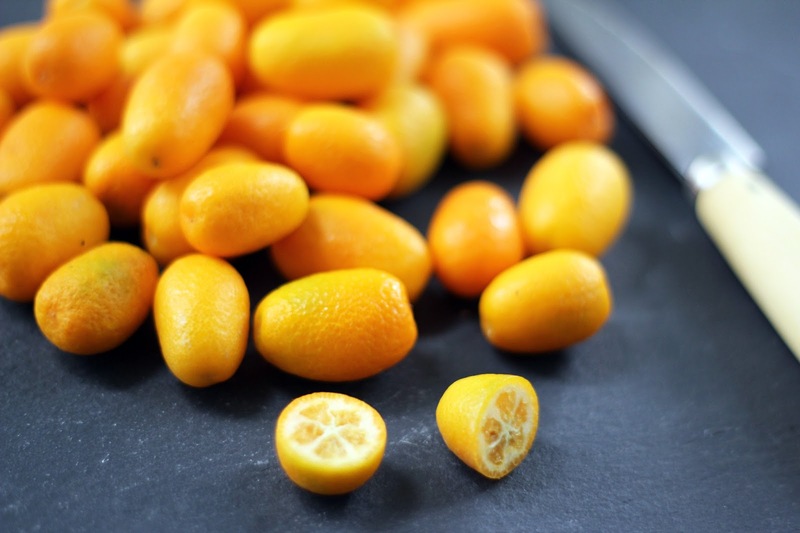 Kumquats are pretty adorable. Tiny and cheery in appearance, they have a thinner, sweeter skin that is much more appealing for me to eat. Perfect for marmalade! 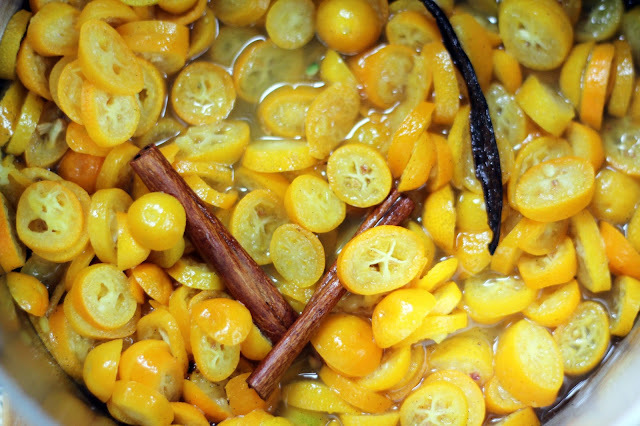 As thoughts of marmalade evolved, I knew I wanted to include some other flavors to round out the tartness of the kumquats. My brother and his family are living in Vietnam and sent us some plump vanilla beans and fragrant cinnamon sticks over the holidays. 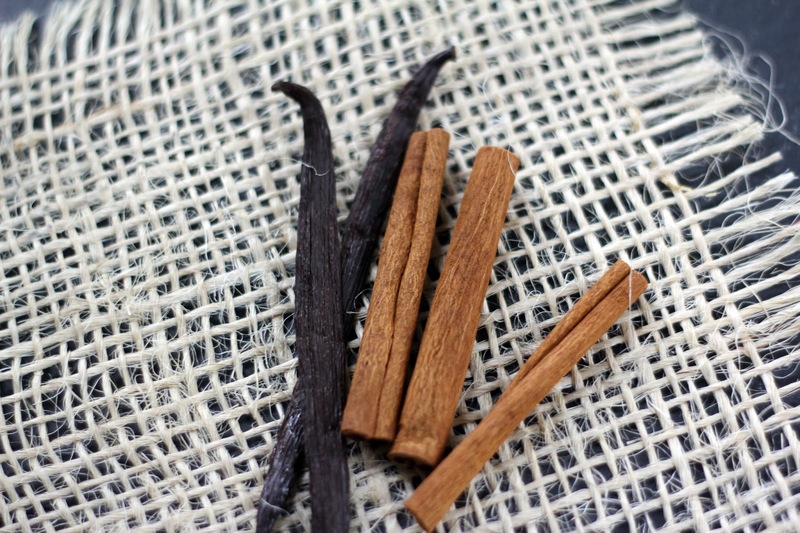 Adding the warm, cozy flavors of vanilla and cinnamon sounded just marvelous and I headed to the kitchen. The pot of marmalade bubbled away on the stove and the scent was intoxicating. After cooling a bit, I gave it a taste. Flecked with specks of vanilla bean and a hint of cinnamon, citrusy and sweet from a bit of honey – yes, I had found my marmalade! I was inspired further and decided to bake with the kumquat marmalade. 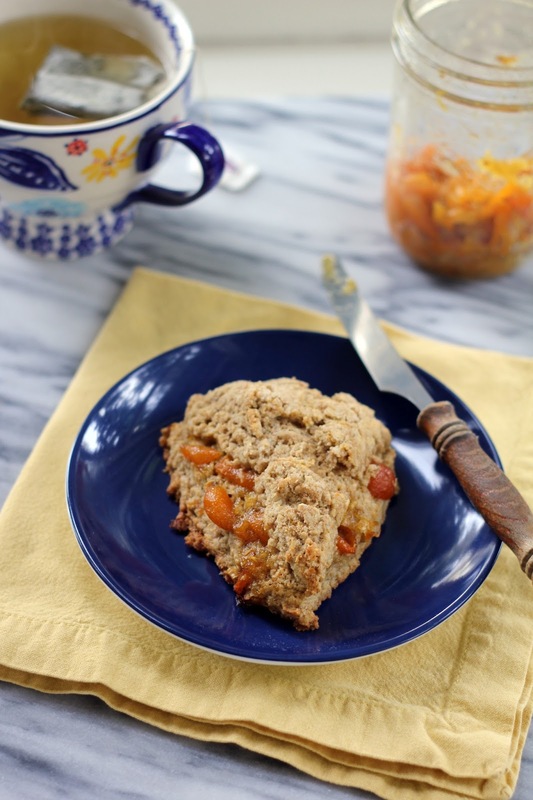 I chose the barley flour scones from Kim Boyce’s Good to the Grain, where the marmalade is baked in the center. They emerged tender and buttery from the oven, with bits of kumquat peeking out. Let me tell you, nothing cheers a dark winter afternoon like a marmalade-filled scone and a cup of tea! In a medium sized sauce pan, combine all the ingredients (including the reserved vanilla pod) over medium-high heat and bring to a boil. Give a stir, partially cover the pan, lower the heat and let simmer until very soft, about 45 minutes. Uncover and cook for about 10 minutes more to thicken a bit, stirring to prevent sticking or burning. Remove from the heat and let cool. 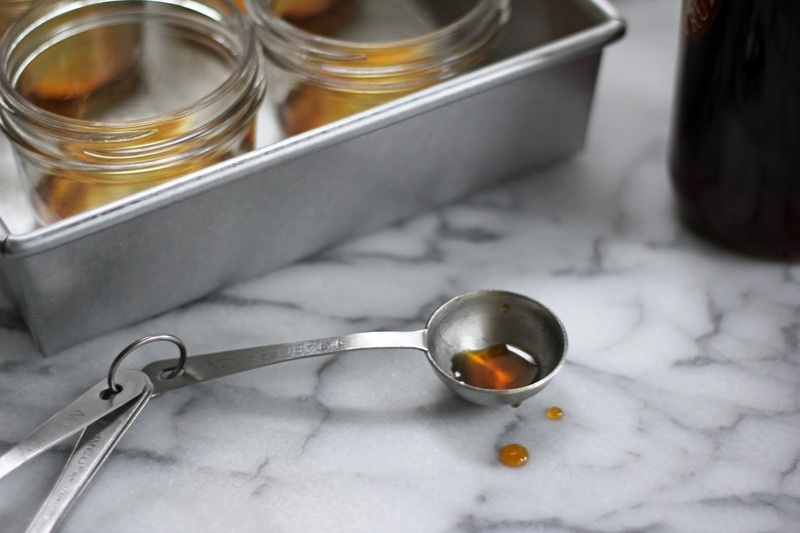 Take the vanilla bean and cinnamon sticks out and spoon the marmalade into a clean jar. Cover and pop into the fridge (it will thicken further as it chills). The marmalade will keep for a month in the fridge.